Senior forward Ben Winnett's (New Westminster, B.C.) 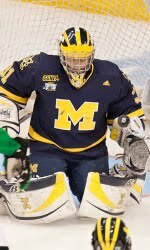 tally at 13:26 of the first period held up as the game-winner and senior goaltender Shawn Hunwick (Sterling Heights, Mich.) was stellar in net with 40 saves, lifting the University of Michigan ice hockey team (No. 2 USA Today/No. 6 USCHO) to a 2-0 shutout win over North Dakota (No. 1 USA Today/No. 1 USCHO) in the NCAA Frozen Four semifinals on Thursday (April 7) inside the Xcel Energy Center. U-M will go for the program's 10th NCAA title on Saturday (April 9) at 6 p.m. CDT against Minnesota-Duluth (No. 3 USA Today/No. 11 USCHO) in the Frozen Four final. ESPN will televise the game live and a free webcast is available at ESPN3.com. Michigan took the 1-0 lead at 13:26 of the opening frame on a goal from Winnett. Freshman defenseman Jon Merrill (Brighton, Mich.) received the puck at the left blue line and rifled a shot that came off the crossbar and landed in front of the crease. With a scrum out in front, junior right wing Luke Glendening (Grand Rapids, Mich.) kicked the puck to Winnett in the low slot, where he wheeled around into the right circle, and roofed the puck over goaltender Aaron Dell, who was down from the original shot.